CAC is emphasis on both software quality and professional services so as to ensure 100% successful implementation for all our customers. Some of our CAC support team members have acquired accountant CPA qualification, MBA, and over 20 years of implementation experience. We will design implementation schedule and stages to suit our client needs. We provide data conversion tools for our client to import data from their old system so as to shorten the implementation time. With our 23 years, we will provide practical opinions to our client for improving their operation workflow. We will monitor the actual implementation schedule to avoid any project delay. 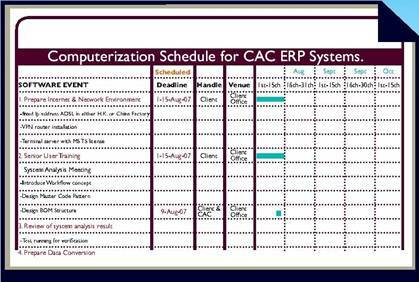 We will provide regular training in CAC Shenzhen, Shanghai and H.K. offices. Our upgrade version helps to improve our customer operation workflow.